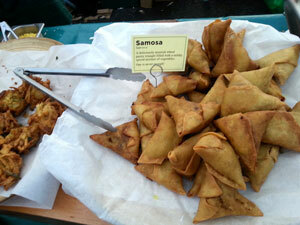 There are so many great food stalls at Broadway Market there is literally too much to digest in one sitting. Following on from my review last week, read on to discover more mouth-watering food and drink and the inspiring people behind the stalls. 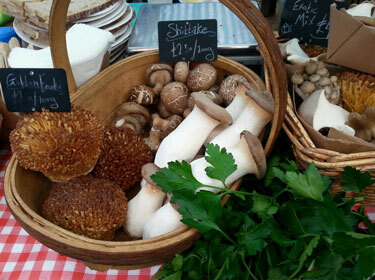 The inviting smell of intense mushrooms leads me to The Sporeboys mushroom stall. They’ve been selling an impressive range of wild, exotic and cultivated mushrooms to supermarket-weary folk at the market since 2005. There is a meandering queue of hungry diners waiting patiently for legendary mushroom sandwich, and a huge pot of unctuous-looking mushroom risotto, to be served. 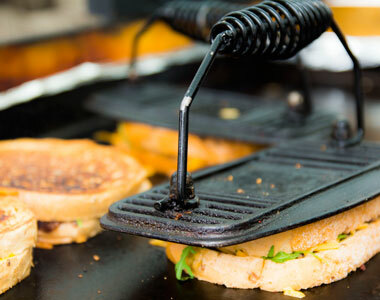 The sandwich is a favourite with their customers and I wanted to see what the fuss was about. A mixture of interesting mushrooms are sautéed in butter and garlic, sandwiched between sourdough bread and finished with parsley, pecorino and olive oil. 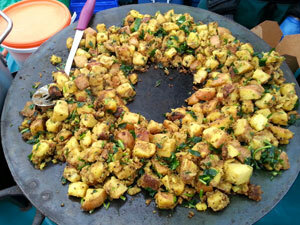 Although slightly tricky to eat while standing up – with a few precious mushrooms falling to the kerb – it was tasty. 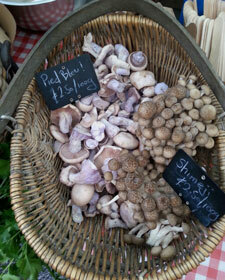 Nice and garlicky, with the parsley and salty cheese complimenting the earthiness of the mushrooms. Zordasht has a colourful and pretty display of fresh, healthy-looking food. An ex-menswear designer called Soli decided to follow her other passion – food. 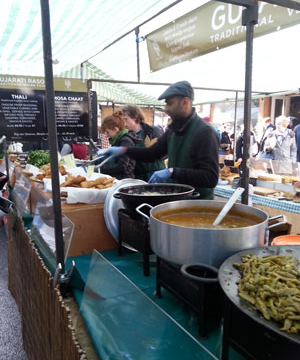 She set up the food stall four years ago with recipes inspired by the traditional Persian cooking she grew up with. 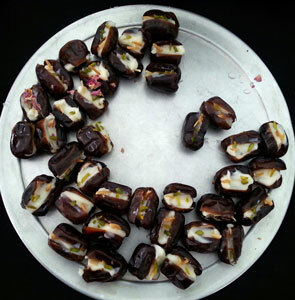 There are Kookoo’s – mini aromatic fritattas – such as spiced beetroot and herbs; pea, chilli and corriander piled up on plates, and beautiful stuffed dates scattered with pistachio and rose petals. It all looks very inviting but I wanted to try her signature dish: the saffron chicken and orange. 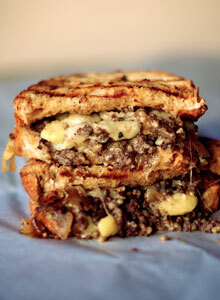 It gets a mention in Timeout’s 100 best dishes in London so it came with a high expectation tag. With subtle spicing and a lovely fragrance: it didn’t disappoint; utterly delicious. 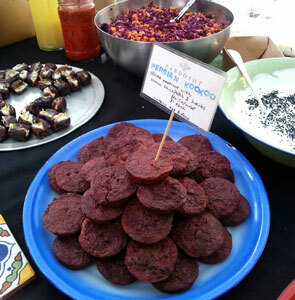 I have earmarked a visit to Cafe OTO to try more Soli’s beautiful Persian food, where she is resident chef. Being a fan of Vietnamese cuisine I stopped by at Hanoi Kitchen. 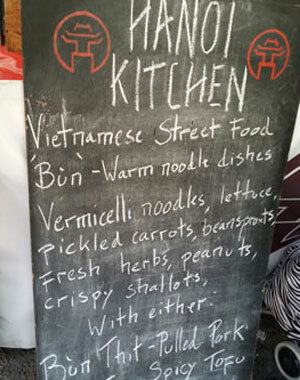 Nigel, the founder, says he found inspiration for the stall from the amazing street food he ate while living in Hanoi. 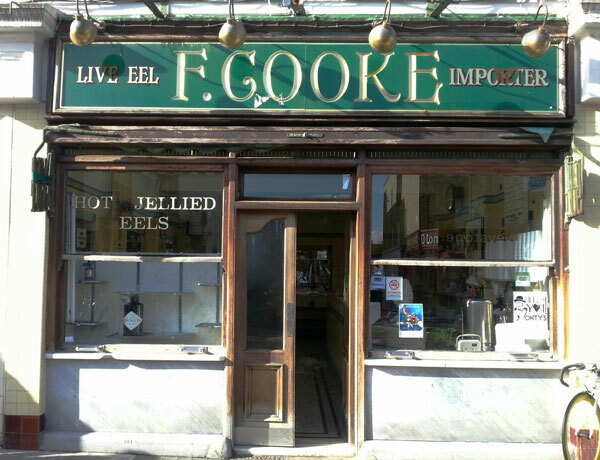 “The food just blew me away”, says Nigel. 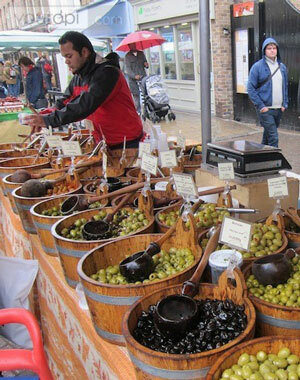 Unable to find anything as good back home, he decided to start up the stall at Broadway. 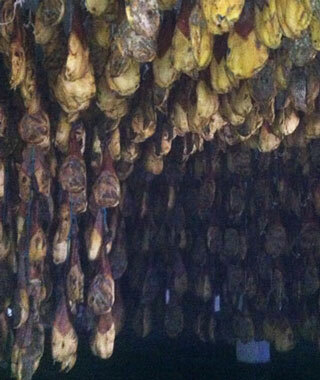 His specialty is ‘Bún’, which are aromatic, warm noodle dishes. The dish consists of meat or spicy tofu with a fragrant broth served over vermicelli noodles, crispy salad, fresh herbs and finished with peanuts, crispy shallots and chilli sauce. The preparation for today’s pulled pork starts off early on Friday. Good quality pork is dry-rubbed with a spice blend then very slowly braised for eight hours with garlic, ginger and chillis. 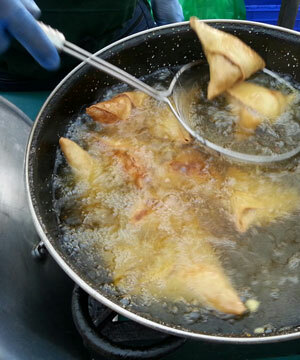 The broth is reduced and more aromatics such as lemongrass are fried and added at the end. 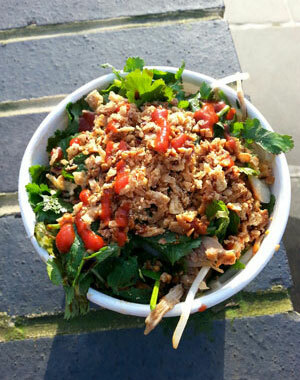 It’s a surefire winner: a warming pot of healthy, delicious goodness with punchy flavours that sets my taste buds alive. Attracted by lines of vibrant deep orange I arrive at Hansen & Lyderson. 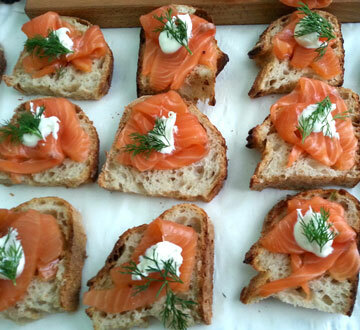 Neat rows of white sourdough (from Elliots Bread), each with a layer of thickly cut slices of smoked salmon topped with crème fraiche and dill. 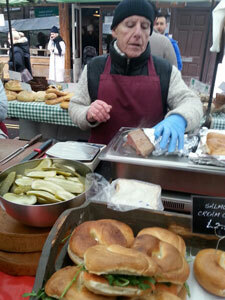 A row of hanging smoked salmon sides swing gently in the wind as I chat to Malek, who works regularly on the stall. It’s all produced by hand and traditionally made in a tiny kiln in Stoke Newington. Currently, about 120 sides are smoked per week, whereas up to 150 sides per day were produced during the run up to Xmas – their busiest time of the year. 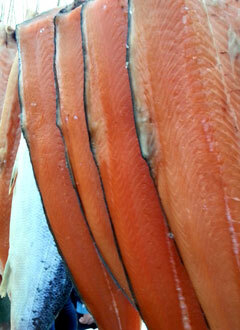 Unlike a lot of smoked salmon that is injected with dyes to enhance the colour, this couldn’t be produced more naturally. Marek tells me that the fish never comes into contact with plastic, no chemicals or additives are ever used and even the wood shavings used are responsibly sourced. The taste is sublime and without wanting to sound over zealous – this is undoubtedly the best smoked salmon I have ever tasted. 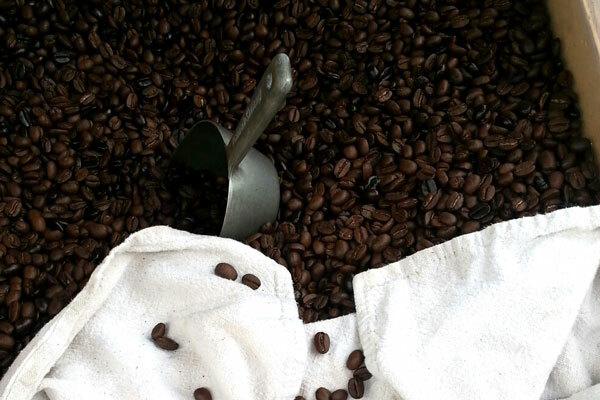 It’s intense without being overpowering, as soft as butter and incredibly smooth in texture. 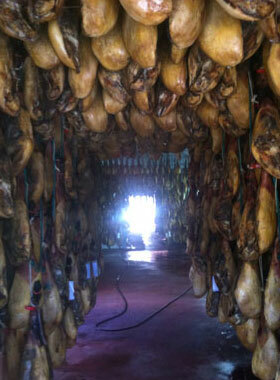 The taste must surely be credited to the care and passion poured into this top quality product. 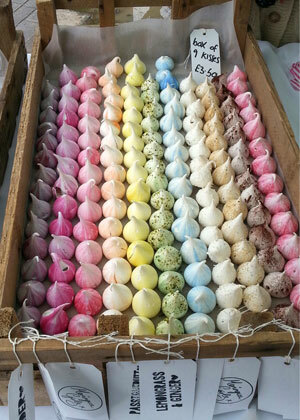 A dazzling rainbow of meringues attracts people like bees to a nectar-laden flower. I’ve heard of the Meringue Girls; their rise to success has been meteorite and they’ve tasted sweet success astonishingly quickly. 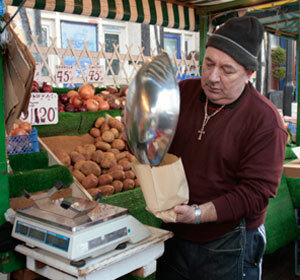 Alex Hoffler and Stacey O’Gorman applied to be on a TV show – Cooks to Market – in 2011, and needed a product. They came up with meringues, and devised innovative colours and flavours to make them unique. They won the show. Since then, their meringues are now stocked in Selfridges, Harvey Nichols and Fortnum & Mason; they’ve launched a cookbook and have a whole host of famous clients. 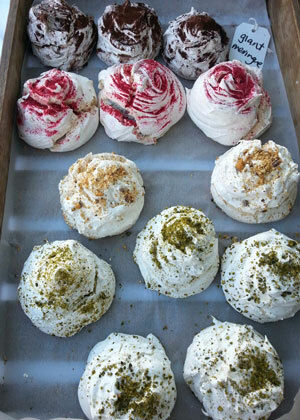 Visually the meringues look stunning. Natural dyes painted inside the piping bags are used to create the dramatic toothpaste stripe effect. 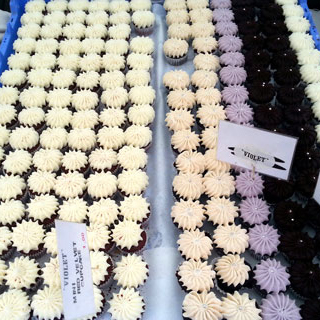 Flavours such as gin and tonic, lemongrass and ginger, and Pina Colada rub shoulders with the more ‘ordinary’ chocolate, raspberry and hazelnut. They are anything but ordinary, as I bite into a raspberry meringue kiss. The flavour is intense and a crispy exterior gives way to a marshmallow-like middle: very moreish indeed. They’re not called The Meringue Girls for nothing. After bracing the chilly wind for hours I was in need of a something warming and satisfying. 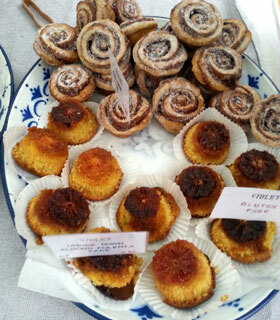 I had gone past caffeine o’clock and I was too full for cake – as tempting as some of the sweet offerings looked. The welcoming face of Jaz, one half of Jaz&Jul’s organic drinking chocolate stall, won me over in a flash. They use the finest chocolate sourced from single origin producers with spices and natural oils to create their delectable range of drinks. Being a bit of a chocolate purist I opt for the Perfectly Simple hot chocolate, which has a cheeky smidgen of nutmeg added. Homemade marshmallows add a further naughty factor. Using their fine chocolate shavings the drink is ready in an instant and I’m soon cupping an intensely rich and warming hot chocolate that puts a huge smile on my cold face. They sell some pretty interesting flavours: cinnamon and rose (bestseller); raspberry with a hint of lavender; caramel and lime; and an Indian spiced masala. Check out their quirky looking website for the full range. Jaz told me: “We’re very strict in our criteria. Our chocolate has to be ethical, fully traceable, free from GMOs and delicious.” They mainly use a cooperative in Grenada and a family-owned company in Madagascar; it’s obvious they really care about the story and people behind the chocolate. They also sell single bars of chocolate and Jaz let me try a sample from ‘under the counter’. Although this particular Brazilian chocolate wasn’t on sale, it gave a hint at the quality Jaz insists on. “We’re actually in the process of sourcing some more origins at the moment, so chocolate samples are arriving every few days from Peru, Bolivia and Ecuador.” If they need taste panel volunteers then I’ll be there in a shot. 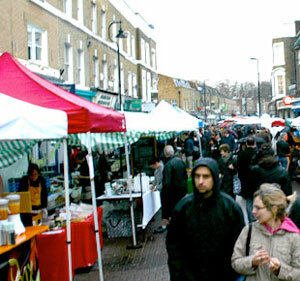 Broadway market certainly lived up to its reputation and I left feeling resplendently satisfied on many levels. 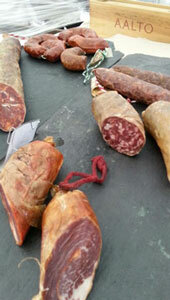 I’ve uncovered the passion and dedication behind some of the produce on offer and tasted some wonderful food and drink. 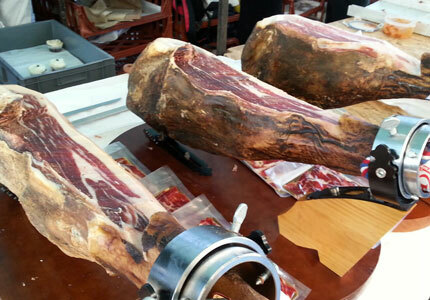 This review is certainly not exhaustive so I suggest you pay a visit to this vibrant and diverse market very soon. 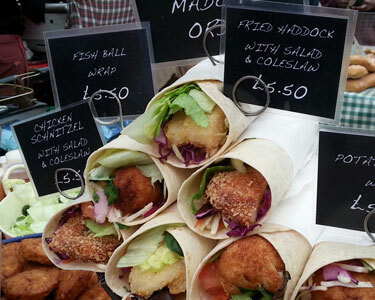 If you missed part one of my culinary Broadway Market review click here. 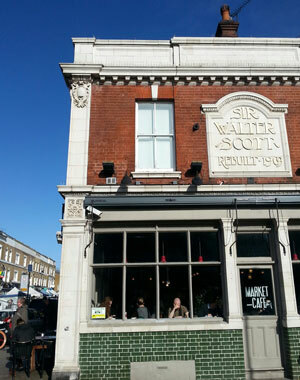 This entry was posted in Fanatical foodies at Broadway and tagged Broadway market, food in Hackney, London street food, Saturday market on 21/02/2014 by Val McArthur.